I don’t know about you, but I can only keep so many balls in the air. There are some that are perpetually in orbit: feeding and clothing (and occasionally bathing) the kids, supervising schoolwork, paying the bills. Putting gas in the car, buying groceries, keeping up with the dirty dishes. Most everything else has to stand in line and wait until I have two seconds, and can actually remember what it is I was going to do. That includes trying new recipes, reading, watching television, DIY projects, and anything involving the garden or cleaning the garage. But I’ve been greatly motivated by a project from one of my favorite blogs, Pancakes and French Fries. Jules has taken the well-known quote from William Morris: “I will have nothing in my home that I do not know to be useful, or believe to be beautiful,” as inspiration for accomplishing one project a week to make her home more functional and beautiful. So I’m going to join her William Morris Project, and see how many items I can cross off my very long list of Things I’d Like to Do Around the House. It helps me to have a schedule and some accountability, so I’ll be posting about my weekly project here every Thursday. If you don’t see me, feel free to comment and prod me! We’ll see how creative my excuses can be. The next step involved finding the caulk gun and the caulk, which required pulling the van out of the garage so I could open the cabinet where I keep my caulk collection. This was a real stumbling block for me. I had to put shoes and a coat on, and actually go outside in the cold. Then I discovered that the caulk had dried up (why don’t all these tubes come with caps?) , but by that time I had to pick up Little Four from preschool. We stopped at the hardware store (this time I bought the expensive caulk–the kind with a cap) on our way to pick up the big kids from school, and since I was on a roll, I caulked that shower as soon as I got home–even before dispensing snacks or directing the unpacking of backpacks. I was going to use painter’s tape to get nice clean lines, as I saw in several online tutorials on the subject, but I completely forgot until I was almost finished. Fortunately, I didn’t make too much of a mess, and the shower pan and tile are white, so any mistakes aren’t too obvious. My next recaulking job is in the kitchen, though–between the white marble tile backsplash and black granite counter. I won’t forget the tape there! So now that the shower is looking much cleaner, more in keeping with all the work we’ve done trying to spruce the place up (new paint on walls, vanity and medicine cabinet, new faucet and hardware, and new towels), I did one last project. We like using shower cleaner spray to keep the shower relatively clean in between scrubbings, but we’re forever running out of the stuff, and I try not to run to Target too often (we all know what a struggle it is to get out of there without dropping $100). 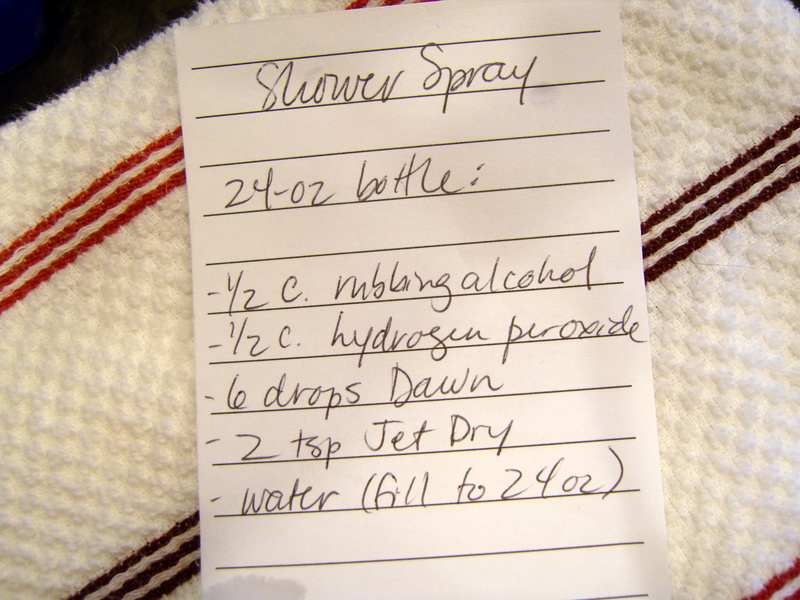 When I cleaned out my desk last week, I found the recipe for a homemade shower spray, and lo and behold! I had all the ingredients in the house! There you have it. 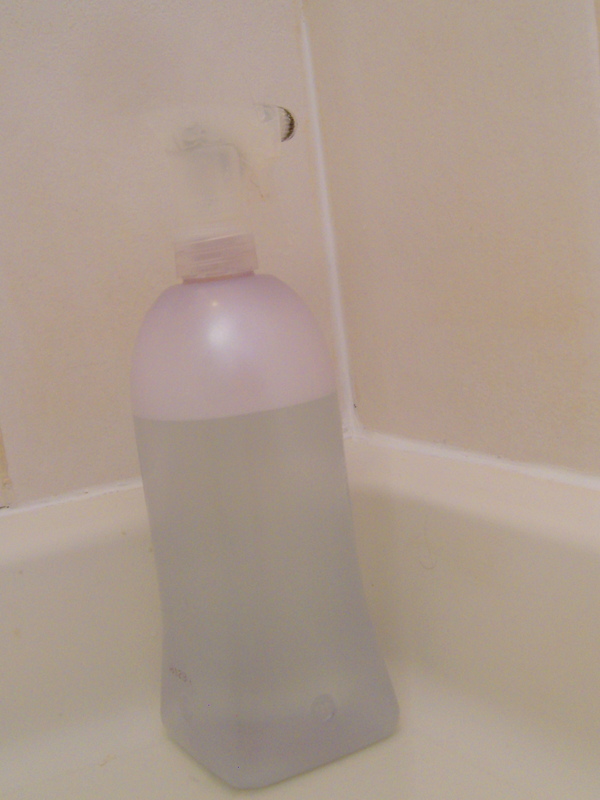 Clean shower, fresh caulk, homemade shower spray. 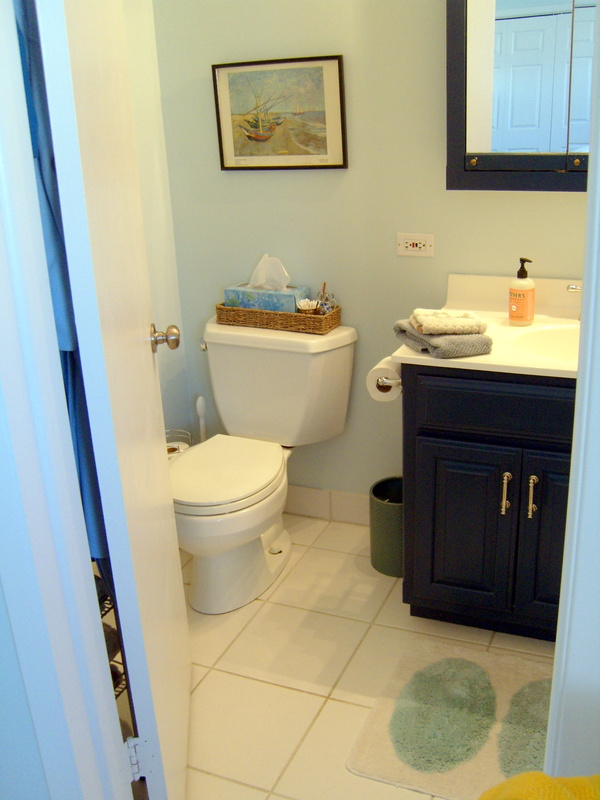 I feel much better about my fresh new bathroom (though I’d like to remove the shower doors one day soon–keeping those things clean is a miserable task–and even when they’re clean, they’re still ugly). Next week I’ll show you my progress on the rest of the master bedroom. We’ve already made a lot of changes, but I’m down to those details that are easy to put off until you completely forget to do them at all. Knobs on the new closet doors, new pillow covers, rehanging pictures…exciting stuff, people! What projects are on your to-do list this year? Anyone else up for joining the William Morris Project? So fantastic! Recaulking my counters in the kitchen has been on my list since October, but I am so intimidated that I put it off. You’ve given me inspiration to try! It’s really not too difficult! And if you mess it up, you just scrape it out and try again. I do think the painter’s tape will make it look really professional. There are (of course) a bunch of YouTube videos that demonstrate how to do it. Lovely post. You’ve inspired me with the Clorox bleach pen. 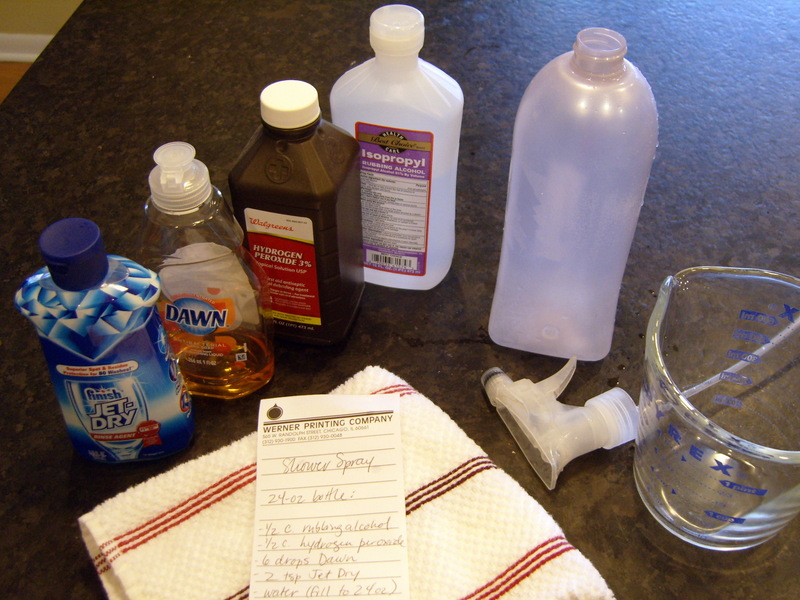 And where did you get that ever so handy recipe for homemade shower spray??? 🙂 I’ve been using that for over a year and my shower doors are still (relatively) clean. Thanks! I think I got the recipe from my aunt…although I remember reading another recipe that included ammonia, so I’m not really certain. I’ll have to report back about how well it works. I do like that it doesn’t have a strong fragrance like the Method brand, which is a little too floral for me. The gel from the bleach pen seemed to work really well at keeping the bleach in contact with the grout for an extended time. I love the color of the cabinet in your bathroom. I painted ours a dark grey, with the walls a pale grey – a huge improvement over the builder’s basic oak that the house came with. Little refreshes can make such a huge difference to a space that is used as much as the bathroom is! The original color was pickled oak–a dirty looking white with the wood grain showing through. 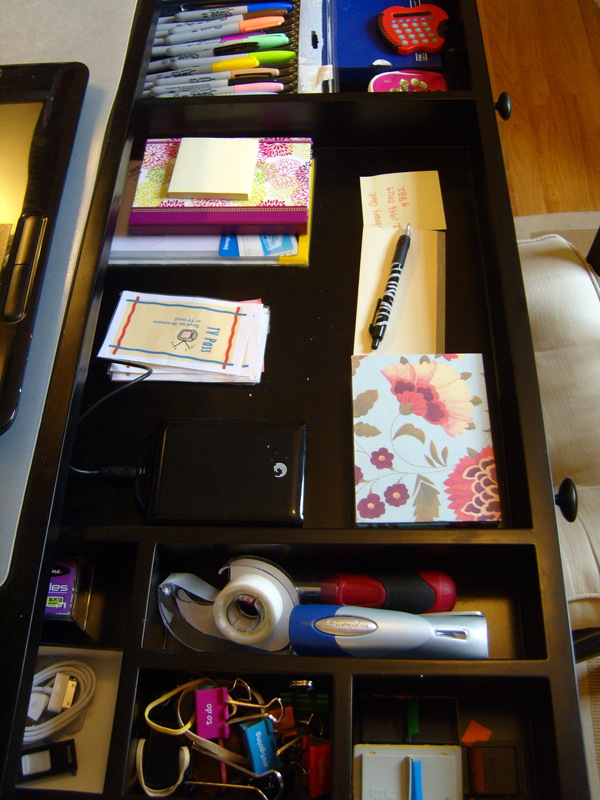 But the cabinet is good quality, and I used one of my free tester pots of Valspar paint from some Facebook promotion! Two little pots covered that vanity, the medicine cabinet (which I would dearly love to replace, but that would also entail getting a new light fixture and probably repairing the drywall behind it), and a large dresser for my son’s room! The paint color is a tad brighter than navy blue. It’s called Basin Blue. Good for you! I have to grout and caulk our nely tiled tub and shower surround and I’m scared. You are giving me courage. Wow! Caulking is such a tedious job. I am impressed, that is one job I will put off for YEARS. Came over from Jule’s link up. 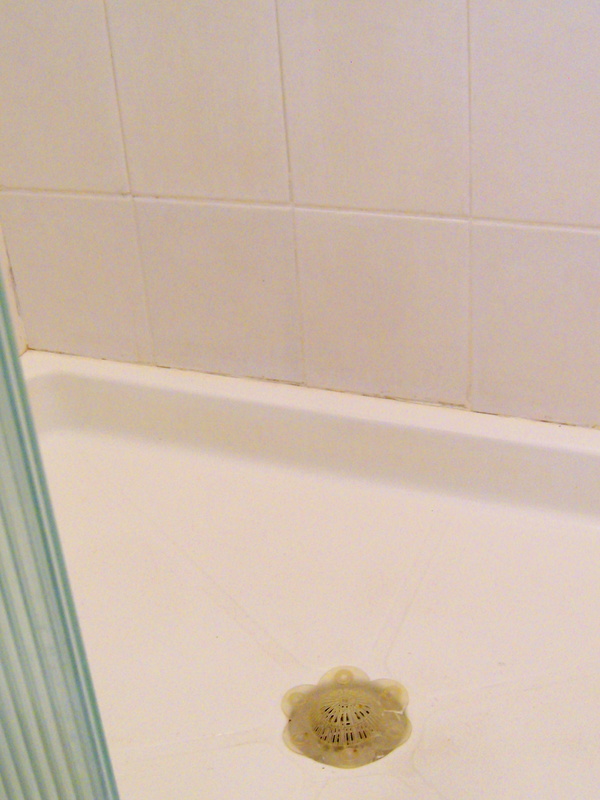 Great job on the shower caulking and thanks for the shower spray recipe, I just pinned it and will need to make that. Don’t even look at my shower right now, it’s a bit scary. Love your progress on your bathroom, can’t wait to see more next Thursday! Visiting from Jules’ WMP. I’m so impressed! 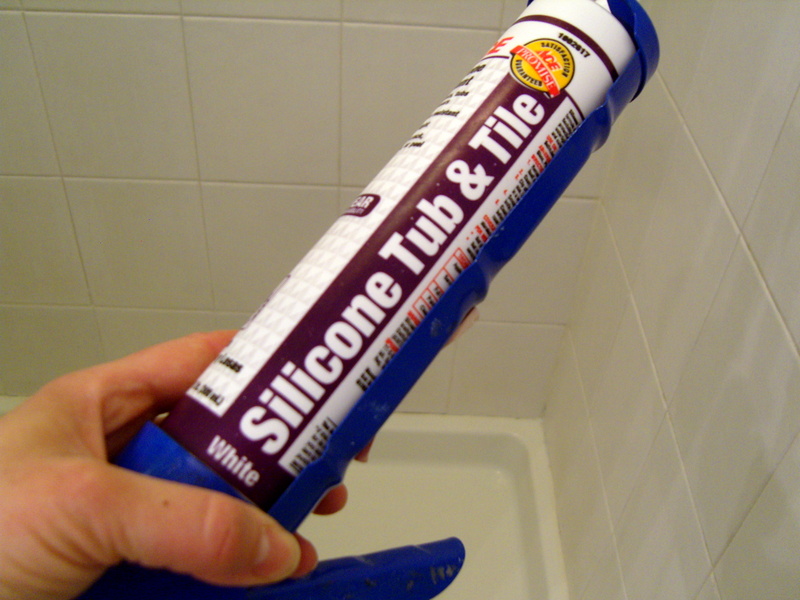 I know my shower definitely needs re-caulking, but I’m going to pretend I didn’t realize that when I read your post! Congratulations on getting it done!